Age and experience should teach us that what we see may not be in fact what we get. While performing a home inspection an incorrect or hasty conclusion could be cause for more than embarrassment. Fortunately, most often a red faced retraction is the often the worst outcome. Experience has taught me that one thing usually leads to another, but there could be something else happening not so apparent. That what is being seen at that moment may be nothing more than a symptom of another problem else where in the house. Take for example frost and water on the roof sheathing in the attic. Often the knee jerk reaction is that the attic lacks adequate ventilation. Attic ventilation seems to be thought of as the ultimate eliminator of two undesirables from the attic, moisture and excessive heat. While it is true ventilation serves this purpose, it also has a limit. 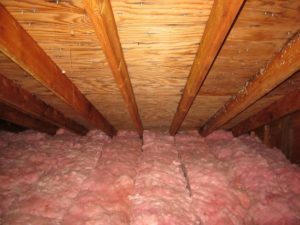 Ventilation can not overcome copious amounts of moisture from typical sources like bathroom exhaust fans that have been vented directly into the attic space. While other sources may not be so obvious. To complicate things further other variables may also be at play, creating conflicting information. On just one side of the roof. Experience has taught me that one side of the roof sheathing being clean is typically due to the house’s orientation to the sun. A warm surface will not condense moisture. It’s not that there is less moisture here or that some undetectable moisture barrier is dividing the attic in two. Its that warmer surfaces and warm air are able to hold more moisture. The dampness is still present, just invisible. So what is causing where is the moisture coming from? The usual suspects were not in play. Bath vent in attic, nada. Old, minimal insulation and a ceiling plane that looks like a gargantuan piece of Swiss cheese, nope. HVAC system in attic or one with a humidifier, no and no. House has baseboard heat. Good, adequate ventilation present, yep. The most likely source at this point is the place furthest from the attic, the basement. And here the likely culprit was found to be an unlikely source of moisture, the boiler. The floor had a large and growing puddle of water around the boiler. The unit’s tank was cracked, had been for a considerable time, resulting is a constant source of moisture. And because the domestic hot water was from a tankless coil in the boiler, the unit ran and leaked all year. So while on first examination, the excessive moisture present in the attic could be thought to be due to a lack of adequate ventilation, in fact it seems to be an entirely different and uncommon cause in the basement. It is often best to keep ones own council until all avenues of information are explored. Realtor here; how did the basement moisture make it up to the attic from the basement? Couldn’t it come from a roof leak on that side of the roof or from ice damming that happened over the winter (which may have only leaked in the winter)? I am curious because my son is in the process of buying a handyman special with a boiler and corners in the block walled basement that get wet and a roof leaking in two places (we saw the water dripping) and roof shingles are lifted from ice & tree debris. When he puts a new roof on in the spring (tarred the roof leaks & they stopped) and addresses the basement I want to be sure he has all the knowledge he can get to understanding a house. 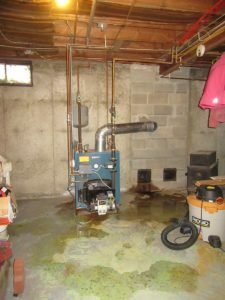 Also, I came across this situation you show 15 years ago and the buyers passed on the house feeling toxic mold must be present as the owners son had asthma and was using his nebulizer machine while we were there. They saw the roof sheathing looking just like in your photo and bolted. 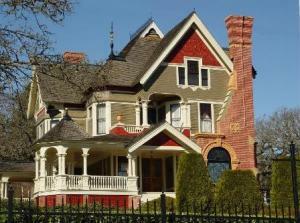 The moisture migrates by natural diffusion through the house and the stack effect, particularly when it cold. And no it absolutely not from a roof leak. I see this condition quite frequently. Ponder this, where do you suppose all that water goes? Well it evaporates, at least what ever is not cleaned up. 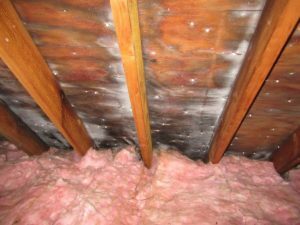 You raise the humidity in the house, that moisture will absolutely end up in the attic UNLESS you have built the house or more accurately the ceiling plane to keep it out. Which would be in most instances a brand new, highly energy efficient home and even then…. As for the black roof sheathing, not necessarily mold. Even if it is, the problem isn’t the mold, that’s a symptom. It’s the cause that is the issue as explained in the post, excessive moisture. Mold testing is worthless, especially in that situation. The way to stop the sheathing from turning black, this is very simplified, is to seal all openings in the ceiling plane, DO NOT use fiberglass insulation (cellulose) and mitigate, manage moisture in the house.